1. Impact Resistant: The extension can stand the heavy impact of hammer drill. The holder is suitable for both C6.3 and E6.3 shanks of screwdriver bits, nut setters and drill bits. 2. Easy to Release: Screwdriver bit, concrete drill bit, and nut setter, etc. can be changed quickly by using our extension. 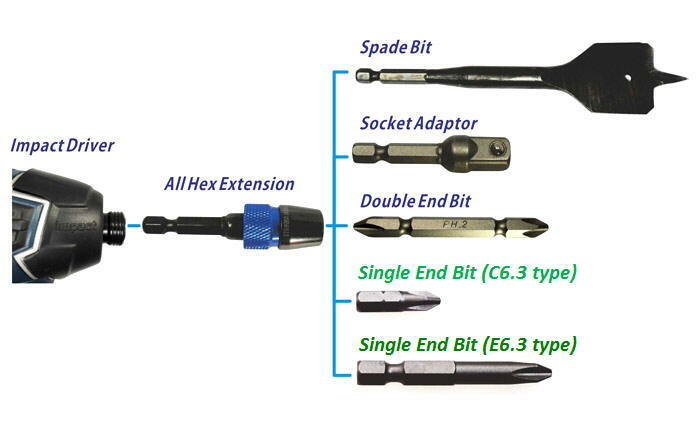 Therefore, not only time but also the cost for the SDS special adaptor is saved. Moreover, the drill bit can be directly inserted into the extension. The heavy screw and nut can be fastened directly as well.